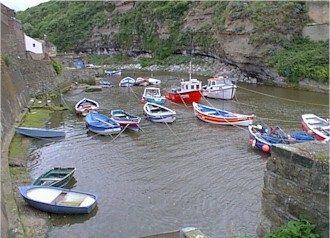 The fishing port of Staithes in the District of Scarborough, North Yorkshire, UK. "Once one of the largest fishing ports on the north east coast of England"
It is hard to believe today that Staithes was once one of the largest fishing ports on the north east coast of England. In its heyday there were just under 300 men engaged in fishing with three trains a week, from Staithes Station on the Whitby, Redcar and Middlesbrough Union Railway, delivering the catch to the rest of the United Kingdom. 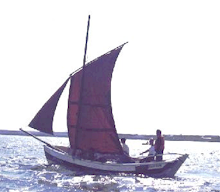 The "Five-Man" had a crew of seven their name being derived by the fact that ownership of the vessel was shared by five persons. 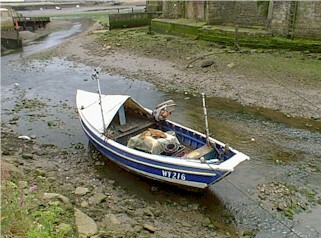 The smaller Cobles usually had a crew of two and were owned by one person. Launched head into the waves and swell explains the high stem and stern, where as the low sides make it easier to haul in the nets and lines. The arrival of Steam trawlers like the one below ended the traditional industry, Staithes had no harbour capable accommodating these boats. Now what few boats remain in Staithes are either for tending the Lobster pots or taking people day fishing, at least one of the boats is registered to take half a dozen passengers out for short trips. Rod fishing for Cod, Rockling, Coalfish or Flounder is possible from the breakwaters providing the weather is not rough. It's a 20 foot drop at low tide so you will need a drop net to land your catch.